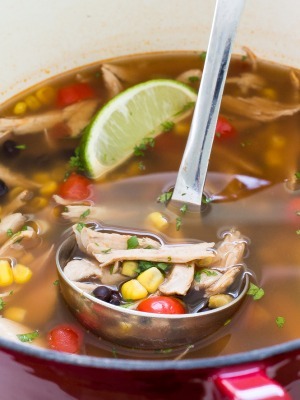 This Easy 20 Minute Chicken Tortilla Soup is a comforting, flavorful and fast weeknight dinner. Top with tortilla strips, cilantro and avocado! We are in the midst of soup season and I couldn’t be happier. I’ve been eating soup almost every other night. From my Lasagna Soup to my Turkey Meatball Vegetable Soup. I just can’t get enough of it. 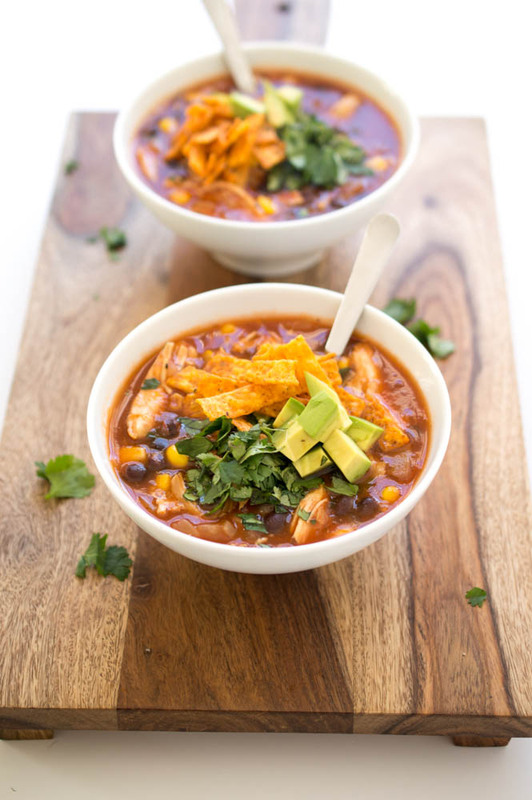 This tortilla soup is loaded with all of my favorite Mexican flavors. Cilantro, lime juice, avocado and tortilla chips. Slightly spicy and full of flavor. There is very little prep time for this recipe. With pre-shredded cooked chicken this recipe takes less than 10 minutes to put together and 10 minutes to cook. This soup tastes just like a taco or enchilada. Full of Mexican flavor, incredibly hearty and comforting. 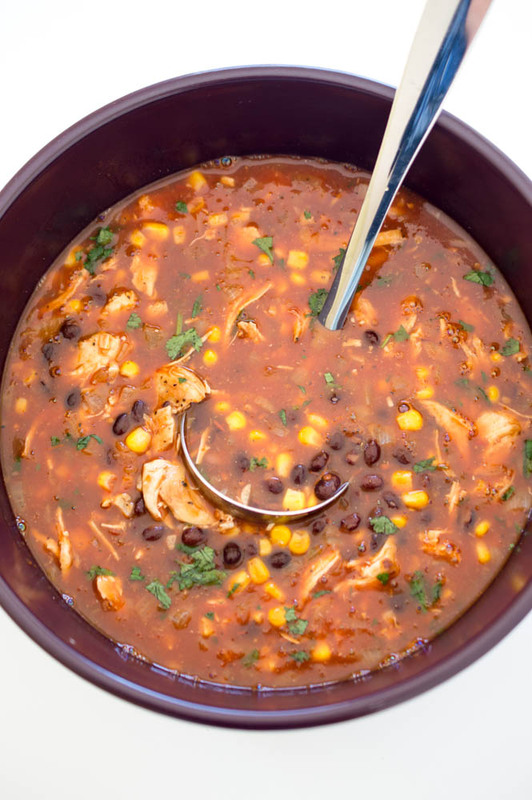 The base of this soup is a blend of enchilada sauce, crushed tomatoes and chicken broth. Black beans, corn, onions and garlic are also added. Cilantro and lime juice get added at the end. Top your soup with extra cilantro, avocado, and tortilla strips. Cheese or sour cream would also go great with this. Cooking the chicken ahead of time saves a lot of time on prep. Cook and shred the chicken the night before. You could also use leftover rotisserie chicken or turkey for a quick substitute. This soup can be made in one pot. Simply saute onions and garlic in oil. Add in broth, enchilada sauce and crushed tomatoes. Stir in your seasoning and bring to a simmer. Cook for 10 minutes and then take off of the heat. Stir in pre-cooked chicken, cilantro and lime juice. Allow the chicken to warm up in the hot soup and serve immediately. Garnish with extra cilantro. Can’t get enough? Subscribe and I’ll send all my recipes right to your inbox! You can also keep up to date by following me on Pinterest, Instagram, Facebook and Twitter. Pour in chicken broth, enchilada sauce, crushed tomatoes, black beans, corn, cumin, paprika and pepper. Take off of the heat and add in lime juice and cilantro. Serve immediately and garnish with avocado, tortilla strips or cilantro if desired. 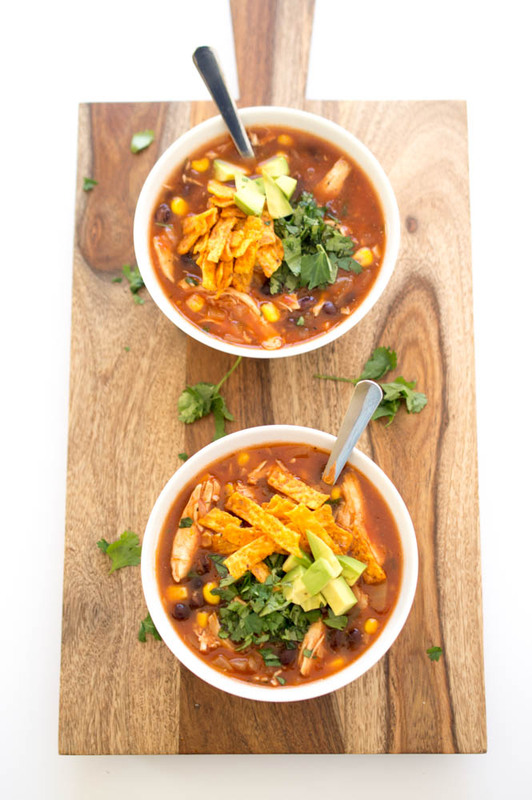 Chicken tortilla soup is one of my best friends, I can’t get enough! And this is only 20 minutes? I’m in love! Mmmmmm. I made a similar soup last week and those pics just made me want to run and make it again! I love soup season! Definitely adding the cilantro and avocado to mine next time, love that addition. I didn’t use those, but they would be great! 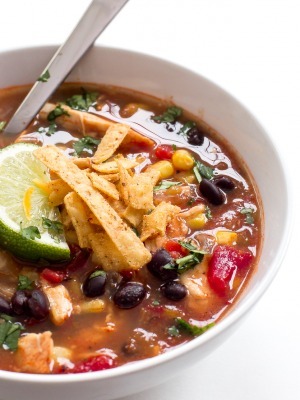 I love chicken tortilla soup and your version sounds so easy and looks delicious! I’m all about easy weeknight dinners, so this sounds perfect. This looks wonderful…and so easy to do! Love the flavor of the ingredients combined here…thanks for sharing! LOVE this recipe! Soups are always so comforting and delicious this time of year. Love the flavours packed into this one dish! Bookmarking to try soon! I just made tortilla soup last week! We must be on the same craving wavelength. Yours sounds awesome…might have to whip up a batch this week! 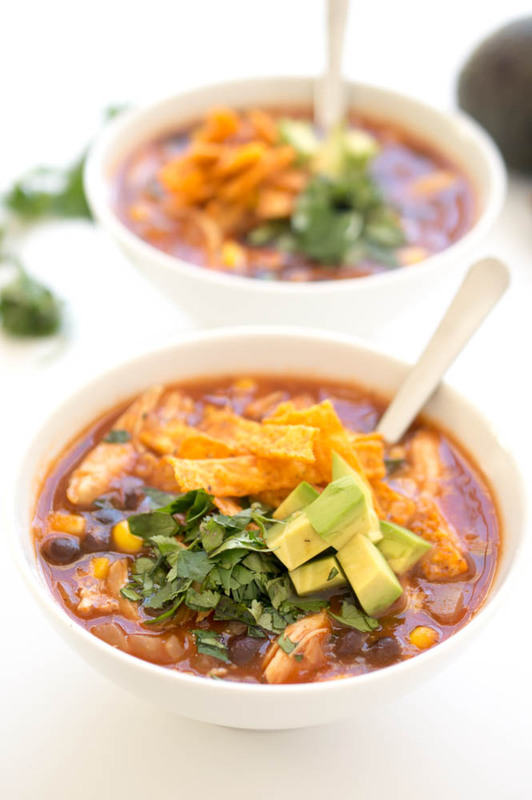 This chicken tortilla soup sounds fantastic, Kelley! I’m loving your 20 minute version! Definitely trying this one out. Pinned! Mmmmmm this looks amaaaazing! Pinned! Delicious! Used a 14.5 oz can of diced tomatoes and jalapeños in place of crushed tomatoes. This will be a weekly go to ! Also I used a rotisserie chicken that I shredded in place of chicken breasts. I also topped the soup with green onions and Monterey Jack shredded cheese in addition to cilantro and avocado and tostitos rolls chips. I was looking for a quick soup to make for a chilly night and this was amazing! Its so flavorful, healthy and super simple to make. I added about 1/2 tsp. of chipotle tabasco for a spicy kick. Cubed avocado, shredded cheddar cheese and a dollop of sour cream made an excellent topping. This is a keeper! Wow! Made this for my family today, very easy to make and sooo good! We love it!! 1. Used bone-in chicken thighs for the meat, cooking them in the soup pot before doing the rest of the recipe. After shredding the cooked meat I threw the bones in the simmering soup as well, removing them when I was ready to serve. 2. Used 15 oz of enchilada sauce instead of 10. Tried it with 10 and felt it just wasn’t quite Mexican-y enough, so I kept adding until it tasted right. 3. Garnished with ample shredded Mexican blend cheese in addition to the tortilla chips, cilantro and avocado. 4. Used 3/4 tsp cumin instead of 1/2 tsp. 5. Used 1/2 black beans, 1/2 pinto beans. Same overall bean volume. I made this tortilla soup. It was so good and so easy to make. So glad you enjoyed this! Thank you! This soup is amazing! Making it the second time within a week! I substituted taco seasoning for the spices (didn’t have them all) and used crushed tomatoes with green Chili’s. Awesome!! I can’t wait to try this recipe on my husband. 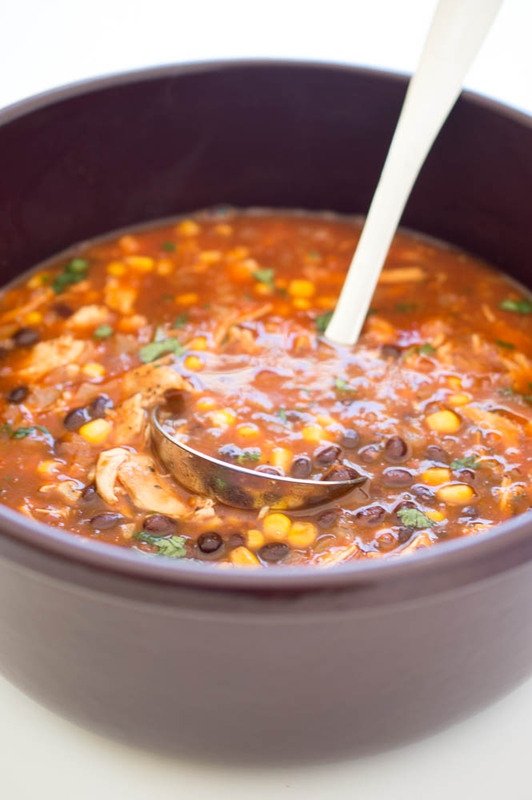 We make a version of this soup, also made in 20 minutes with jar salsa south western style as the soup base with the chicken broth, add extra corn ( I like white sweet corn) in mine and black beans. I like the idea of adding enchilada sauce. I’m going to try to use green sauce since I have to eat mild spicy, anything more than that doesn’t agree with us. I can’t wait to try this. Thank you for your recipe and the photos make your mouth water. They are great. Thank you so much Dawn! I hope you and your husband enjoyed this recipe!